Although getting customers as a taxi driver in 2014 won’t be difficult because of currently strong levels of economic growth, one of the things you might struggle with is how to beat your competitors. There are plenty of taxi firms and independent taxi drivers who are vying for the same customer base, so how do you get the customer to choose you? We’ve scoured the internet and think that the following three tips will start you off in the right direction. It’s a plain and simple truth that if your taxi firm charges a high fare price, you aren’t going to attract many customers. This is particularly the case if you’re a private hire cab that can’t pick up customers from a taxi rank because people tend to compare prices before they book for private hire. Therefore the first thing you should do is level the playing field with your competitors by offering a competitive price. Next, you should help yourself to stand out by offering special discounts or deals on specific days such as Valentine’s Day. What it means to beat your competition is to take business away from them, and the best way to do that is to ensure your company receives as much repeat business as possible. The best way of doing this is to provide a good service which your customers can’t get elsewhere, and this means being a people pleaser. Be courteous and polite and gage how much your passengers wish to talk. Finally, thank them for their business when the journey is over, because these kinds of small personal touches are the kinds which will really drive repeat business. A final way to drive business to your taxi company is to ensure you’re catering for the widest range of people out there. 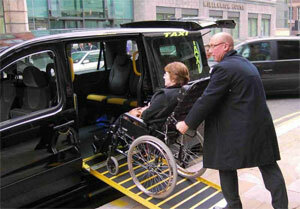 For example, if your taxi is wheelchair-accessible like the ones available from Cab Direct, you’ll be able to offer your services to the disabled community, which won’t only make you more profitable, but it will also increase your job satisfaction. Therefore, offering extra value through broader taxi accessibility might just help to keep your competitors from your door. If you’ve been worrying about your taxi driving competition in 2014, you don’t have anything to really worry about if you follow the steps above. Buying A New Car? Make Sure You Don’t Make These Common Mistakes!